By Jason Davis – WASHINGTON DC (Feb 1, 2019) US Soccer Players - The end of Sebastian Giovinco’s time with Toronto FC came with a suddenness that caught everyone by surprise. Whatever the factors that led to Giovinco's exit from the club he helped turn into an MLS juggernaut, the rapidity of his transfer to Al-Hilal of Saudi Arabia comes as a shock just a few weeks into preparations for the 2019 MLS season. He cost Al-Hilal seven-figures, though the exact fee will remain a mystery thanks to the league’s frustrating lack of transparency. Trying to pin down whether the Reds got good value for the attacker requires an examination of the situation around Giovinco’s departure. Giovinco is 32, having just hit that number with his birthday last week. His Toronto FC contract was set to expire at the end of 2019. The club had an option to extend the deal through the 2020 season, but apparently gave Giovinco himself a reason to believe that wouldn't happen. By moving him on, Toronto FC saves the $7.1m in salary he earned last season. Facing the prospect of Giovinco leaving on a free transfer next winter, the Reds took what they could get. On the surface, the amount seems small, especially considering Giovinco’s presumed value to Toronto and the difficulty the club will face in replacing him. Still, without a raft of other suitors, the price Al-Hilal offered Toronto might have been the best they could do. Giovinco’s own disillusionment with the program in Toronto, the result of the negotiations the player and the team had over a potential new contract, admittedly played a big role. When Giovinco suddenly left TFC’s training camp on Sunday ahead of a mooted move, the club pushed back against reports of a transfer. According to them, Giovinco left camp to visit a specialist due to an injury, not for a physical that would push along a sale. Club president Bill Manning even went so far as to publicly disclose that the Reds had fielded an offer for Giovinco but had turned it down. He went on to say that a counter bid had yet to happen. With Giovinco now gone, that's beside the point. Toronto now has to replace not only the greatest player in club history but the player who transformed TFC with the mere act of signing an MLS contract. Giovinco’s MLS arrival was a seminal moment for Toronto and the league. While neither of those facts should necessarily inform his future salary, they do make it harder to sell to fans. Separated from his jump from Juventus to Toronto by four years, it’s easy to forget just how remarkable TFC’s acquisition of Giovinco was ahead of the 2015 season. Giovinco was a talented reserve at Juventus, capable of scoring goals but typically rooted to the bench. His talent was well-known, meaning that Giovinco had options. Back in 2015, the idea of a player in his prime with viable European options choosing MLS over the Continent was laughable. MLS was still working through it’s “retirement league” period. They were more likely to welcome 30 and older fading Euro stars looking to cash in on their fame as much as their talent than any player in their 20s. Especially one who could command a move to a mid-table club in any of the top five or six leagues in Europe. 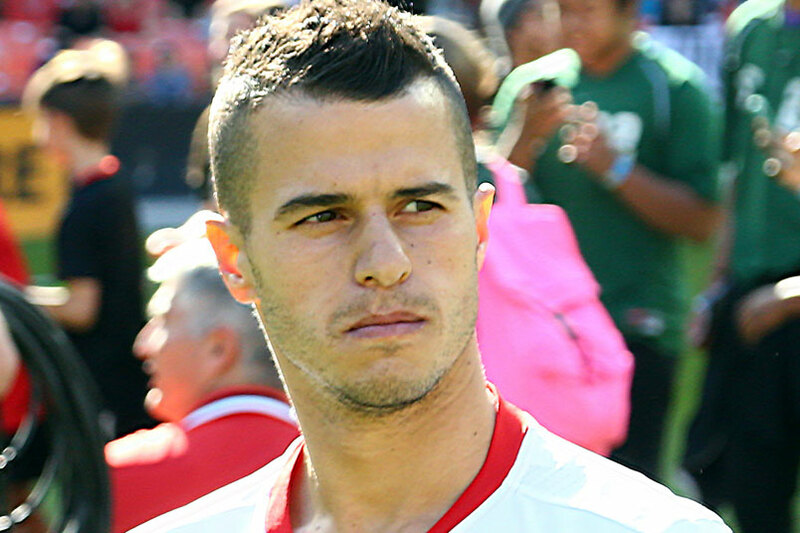 TFC paid a premium to convince Giovinco to move to Canada. Before Atlanta’s arrival and the new ambition that has marked a shifting spending environment across the league, Toronto’s brazen move for Giovinco reverberated across the continent as a statement of intent for MLS. The signing sent a message. If MLS clubs were willing to overpay relative to their European peers, it could attract a higher level of talent at younger ages. Giovinco’s signing would have been big even if he wasn’t the best player in MLS. He was exactly that. From 2015 when he exited Juventus earlier than planned to get a better start to his MLS career and subsequently put up a historic 22 goals and 16 assists through to the triple trophy season in 2017. Even as more elite talent followed Giovinco’s lead and landed in MLS, he wowed with his penchant for stunning goals. With Michael Bradley and Jozy Altidore, Giovinco was part of a group that transformed Toronto. Even in a league where a quick turnaround is possible, what Toronto managed thanks to Giovinco’s influence was remarkable. On the field, Giovinco was electric. The problem and a factor in the decision Toronto made to pass on his option and ultimately sell him, is that injuries were an increasing issue. 2018’s totals of 13 goals and 15 assists put Giovinco in the league’s top-tier, but his 28 league appearances in 2018 were the fewest in his four-year MLS career. It’s not a distressing number on its face, but it was likely an issue in Toronto's choice. For TFC, the job now is to convince the fans that Giovinco’s sale doesn’t mean the end of the club’s ambitious approach. Reports that the ownership group would like new general manager Ali Curtis to rein in spending run rampant. Turning around and locating a natural replacement for Giovinco won’t be easy. It’s unlikely that anyone will measure up to him in the minds of the faithful. Selling a club legend looms over this season. Toronto’s run in the rapidly approaching Champions League could trickle into the beginning of the MLS season. Considering that TFC fell flat last year in MLS play due to a variety of factors, the organization is short on credit with fans. 2017 was a glorious year and the 2018 Champions League final appearance puts Toronto in esteemed MLS company. What followed created disillusionment at BMO Field. This remains a notoriously rough "what have you done for me lately" business. Giovinco fired a parting shot via Instagram that further complicates things. In a clearly formulated missive that includes Giovinco pointing to his role in how the championship group have “grown the brand”, the player claimed Toronto FC no longer wanted to do what it takes to win. Fair or not, words from the best player Toronto FC ever had has weight with fans crushed by his departure. They, and much of MLS, will remember Giovinco fondly. He elevated the league and his team with his play and will go down as one of the greatest ever in Major League Soccer. By saying goodbye to Giovinco, Toronto FC probably believes that they've made the best choice available. That doesn’t mean moving on will be easy.